You are here: Home / Posts / Giveaways / Competition / Thank You for Entering the 2014 Grilled Cheese Recipe Showdown! Thank You for Entering the 2014 Grilled Cheese Recipe Showdown! We would like to say a big “thank you” to all the creative cooks who have entered their grilled cheese recipes in the 2014 Grilled Cheese Recipe Showdown! And for those who have not yet submitted a recipe, today is your last chance – the contest will no longer be open for entry after 11:59 p.m. EDT. In the near future, the Grilled Cheese Academy judges and guest judges – MacKenzie from Grilled Cheese Social, Paula of bell‘alimento and returning judge Heidi of foodiecrush – will be taste-testing the top contenders and crowning a new champion. The “Best of Show” recipe will be awarded $10,000, the “1st Place” recipe will be awarded $3,500 and the “2nd Place” recipe will be awarded $2,500. In addition to the top three placed recipes, each guest judge will choose her own “Judge’s Choice” grilled cheese recipe to be awarded $1,000. 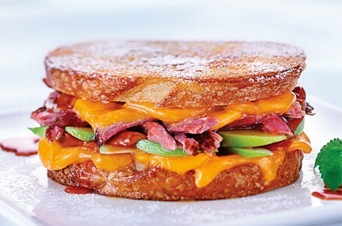 For full contest entry details, visit www.GrilledCheeseAcademy.com.